As he waits for his doubles partner senior Drake Brizendine to serve the ball, junior Jacob Hoffman keeps his eye on the De Soto player. 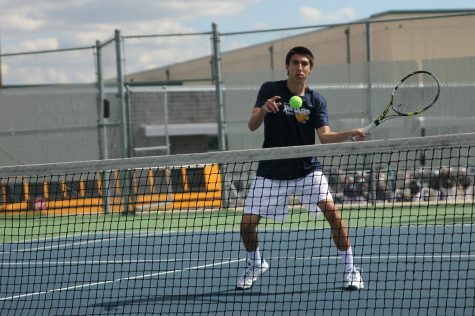 The boys competed in the regionals tournament from Thursday, May 3 to Friday, May 4 at Pittsburg High School. 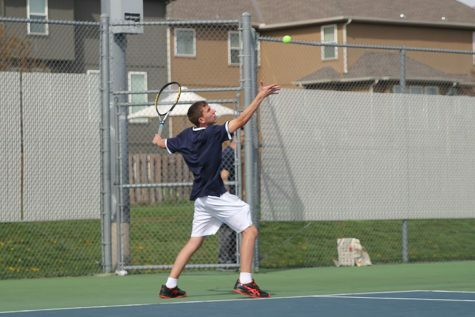 The boys tennis team competed in the regional tournament at Pittsburg High School on Friday, May 4, resulting in a third place team finish. 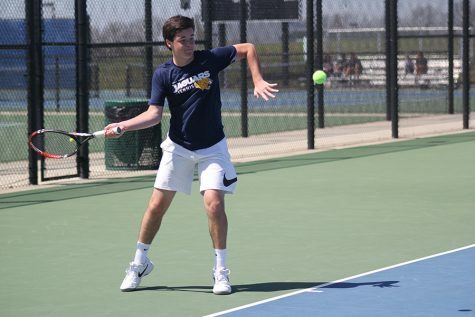 Individually, junior Eric Schanker placed fifth, the doubles team consisting of senior Drake Brizendine and junior Jacob Hoffman placed third, and the doubles team consisting of seniors Landon Butler and Erich Schulz placed fifth. These top-five finishes qualified all five players for next weekend’s state tournament at Emporia High School. 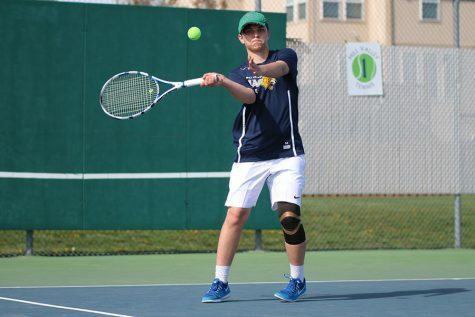 Butler was proud of the team’s ability to come close to last season’s second place finish at the tournament, despite having only one returning player. Having to fill the five lost spots was difficult according to head coach Steve Bock, but he and assistant coach Mike Bennett feel accomplished to have developed such a strong team. 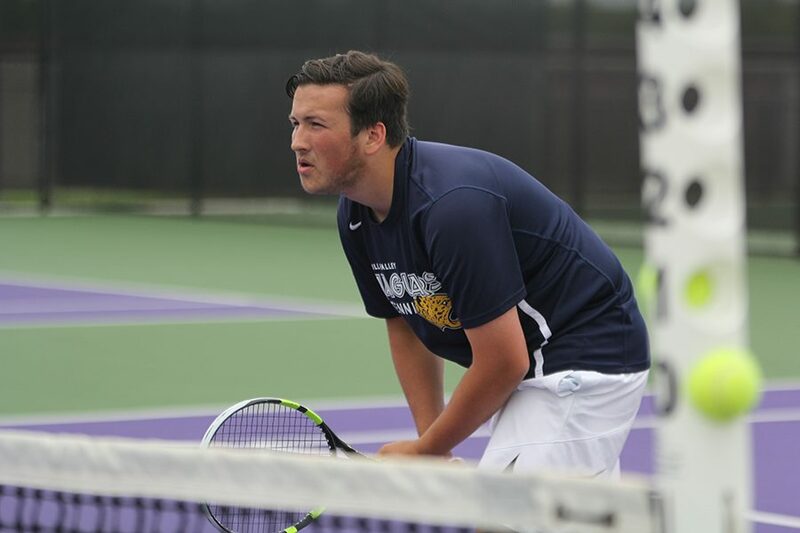 Playing at the position of number two doubles all season and seeded ninth in the tournament, the team of Butler and Schulz was faced with tough competition on Friday. According to Hoffman, although seeded higher, he and Brizendine struggled early on with their connection as a team. 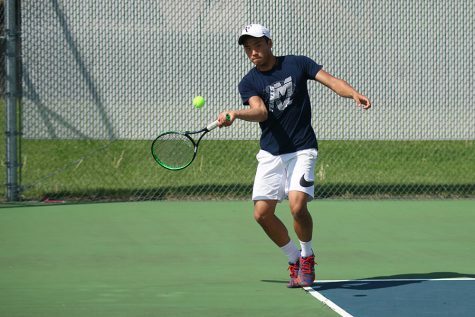 The five will be take on many of the same teams they encountered Friday, in addition to many from regions around the state in Emporia on Friday, May 11. Bock is confident in the team’s ability to put up a strong fight next weekend if they prepare. For Hoffman and Brizendine, this preparation includes practice devoted to ball placement. 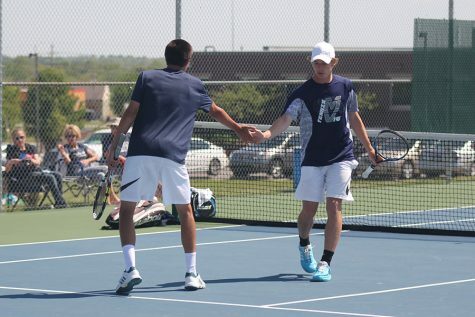 As the state tournament marks the last of the year, Bock is proud of how well the season unravelled.